Posted in: Weekly Post. Tagged: gmail, gmail categories, mateo, Money, promotions, rollup, saving, social, time, unroll, unroll.me. I have always said that Google owns my digit soul. And it’s true. Just about everything I do is vested in Google. When Google was releasing the first Android phone, the G1; I dropped my carrier and switched to T-Mobile just so I could buy it. Picked it up on launch day. Everything revolved around Google. Remember a time before smartphones where you didn’t get your email on your phone? I do. I also remember after I got my first smartphone, I would be checking my phone every 10 minutes because I got a new notification. Well, now I am trying to limit the number of times I look at my phone. And while this doesn’t directly relate to money, time is money and this has been saving me time. Time I didn’t even realize I was wasting. 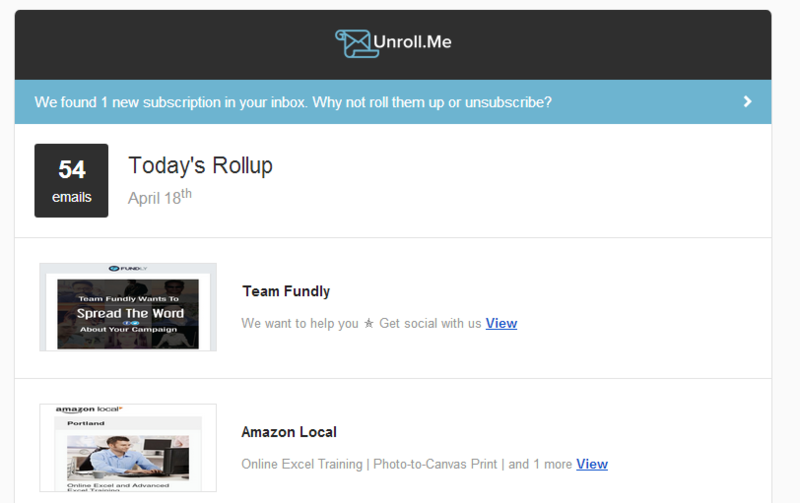 I have been using a service called Unroll.me for over 2 years now (since the private beta) and I love it. It cut down on the number of email I was reading a day by a ton. Basically what it does is filters you email. You can choose to have an email keep coming to your inbox, be added to your rollup, or unsubscribe from the email. Your rollup is an email you get once a day (you can choose when you get this email) with all the emails you selected to be part of your rollup listed in there. Here is a picture to give you an idea of what it looks like. All you have to do is click on the email you want to look at and it opens it up in a new tab with the full email contents displayed. It is great because I can skim through all the advertising emails that I get once a day instead of looking at my phone every 10 minutes when I get a new email. As you can see today’s rollup has 54 emails. That’s 54 emails I am not looking at throughout the day. During the weekdays I average between 40-70 emails in my rollup and on the weekends around 20-40. Here is my only issue with Unroll.me which really isn’t an issue with them. The way it works in Gmail is it tries to monitor your email. So when an email comes in that is on your rollup, it marks it as read, labels it with Unroll.me, and archives it. The issue is there could be a delay before this event is triggered. So my phone would still go off because I got an email. But by the time I checked my phone Unroll.me had done it’s thing and the email was already gone. It was frustrating and a huge time waster. I was talking to my friend Mateo about this and he suggested I enable the Gmail Categories. I tried this when they first came out, but it just wasn’t working for me. And they didn’t update the Gmail Android app right away so I was missing emails. Based on his suggestion, I decided to give it another try. Oh man this is great! Now when emails come in, they get moved to my Social or Promotions tabs right away. Then Unroll.me runs and marks them as read and archives them. And since I do not have notifications setup for these tabs, my phone never goes off. It’s beautiful. I didn’t realize how much my phone was going off until now. Now I get like 4-10 emails a day and they are all important emails that I need to get. I also setup my phone to only be on vibrate during certain periods. Which means I check my phone even less and it only goes off at select times during the day. Win! Anyways, if you are tired of getting constant email notifications on your phone check out Unroll.me and use the Gmail Categories if you use Gmail. If you don’t use Gmail then I feel sorry for you and will pray for your digit soul.